For the safety of our students our carpool is a "NO PHONE ZONE". Please refrain from being on your cell phone during carpool. The route described below is for both AM and PM times. Please review these procedures to ensure that your student’s drop-off and pick-up is a safe experience. Please do not drop off or pick up students in the front parking lot. This area is for those parking and coming into the building. Please use the left most lane to drop off and pick up your students. Only load and unload students along a sidewalk on east or west side of the school. Marked as red on the map. Do not stop in the right lane because this stops the traffic flow. As a spot opens up along the sidewalks, pull in for drop off and pick up. The idea is to flow like the SLC airport plan. The outer lane should always be moving. 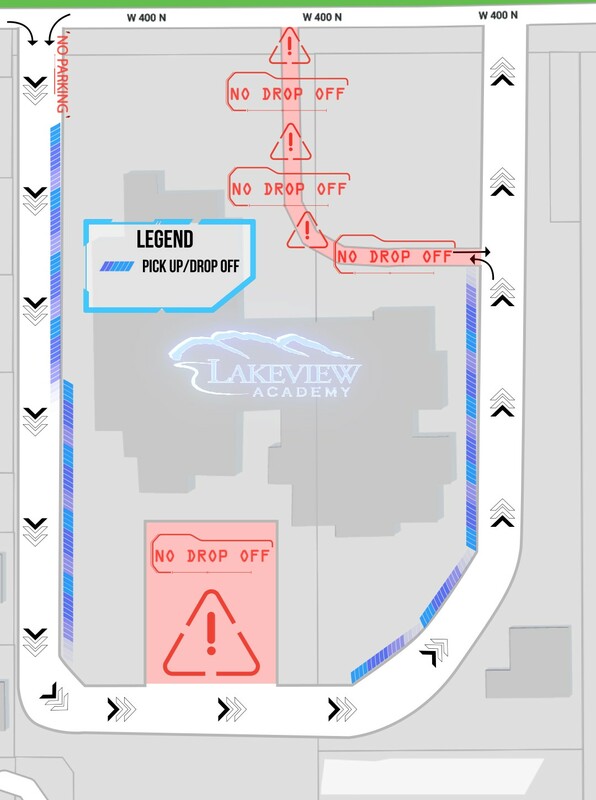 The school does not designate specific drop off or pick up spots for students. Please refer to the map and discuss with your child(ren) an area where you will pick them up. Please do not park your car and leave it for any reason in the drop off or pick up zones. If you need to leave your vehicle, please park in the front parking lot. Junior high students will not be allowed to play outside before school begins. Junior high students need to head to breakfast in the cafeteria or go upstairs to the junior high area until 7:55am. When the bell rings they can go to their lockers and first period. Please be courteous to aides and teachers who are outside to supervise the drop off and pick up process. Their only interest is the safety of every students.